A US federal court has found a Russian software firm not guilty of creating a program which cracks the security features of electronic book software. Moscow-based ElcomSoft was charged with violating the controversial 1998 Digital Millennium Copyright Act. However following a two-week trial in San Jose, California, a jury found that the company had not wilfully violated the US law, which prohibits the sale of software which can break digital locks on digitally formatted films, music and other software. If convicted, the company could have been fined up to $2m. The case had been eagerly watched by entertainment and software companies, which back the law, and by academics and free-speech advocates, who argue it is too broad. ElcomSoft was accused of selling online tools to circumvent technology used by Adobe which was designed to stop anyone from making copies of electronic books. The case had attracted widespread attention since July 2001, when the FBI arrested an ElcomSoft programmer, Dmitry Sklyarov, during a Las Vegas hackers' conference where he was speaking about the company's technology. At the time, both Mr Sklyarov and the company were charged under the DMCA. 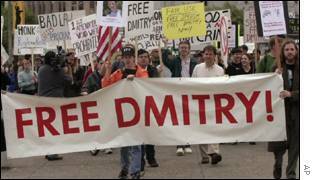 The arrest led to protests by free-speech groups and a "Free Dmitry" campaign. The charges against Mr Sklyarov were dropped in exchange for his testimony. The case was widely seen as the first real test of the US Government's attempts to police copyright in a digital age of file-sharing over the internet and CD-burning at home. The Digital Millennium Copyright Act followed concerns from the entertainment and software industry about the internet's impact on their ability to prevent widespread computer piracy. Supporters of consumer rights and free speech say that criminal prosecutions based on the DMCA could stop encryption research and other legitimate activities. The prosecution alleged that ElcomSoft's software violated the law because the company knew it was selling a product designed to skirt copyright protections.